I started off my morning by going to the Mission Theatre to listen to a talk by author Rose Servitova about her book The Longbourn Letters: The Correspondence between Mr. Collins & Mr. Bennet. I had never read the book before, but she was so entertaining that I picked myself up a copy and plan on reading it soon! I hung about the theatre for the next event – a talk with Adrian Lukis, the actor who played the cad Mr. Wickham in the 1995 production of Pride and Prejudice. My favorite part was when he told us a scandalous story involving him and Colin Firth, an abundance of alcohol, a Jacuzzi and a lack of clothing! Oh, if only I could’ve seen it in person! Afterwards I went over to the Percy Community Centre for the final Regency dance workshop in preparation for the Masked Ball that evening. 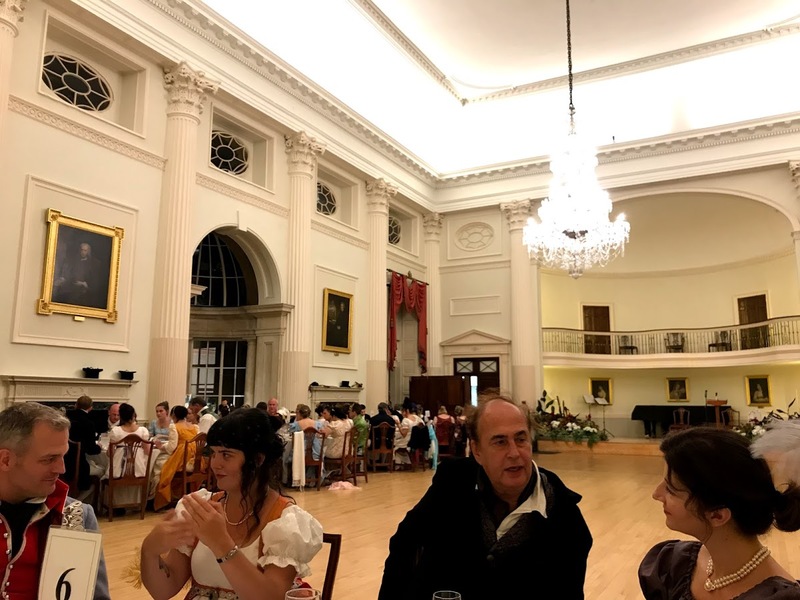 I got a chance to go over the dances that would be danced in the ball as well as burn some calories, which was quite fortuitous as following the workshop, I was invited by David (my favorite dance partner in crime) to have tea at the Pump Rooms. This was the one location that I had yet to grace in Bath, and I felt very spoilt as I was treated to an extravagant afternoon tea with wonderful conversation. 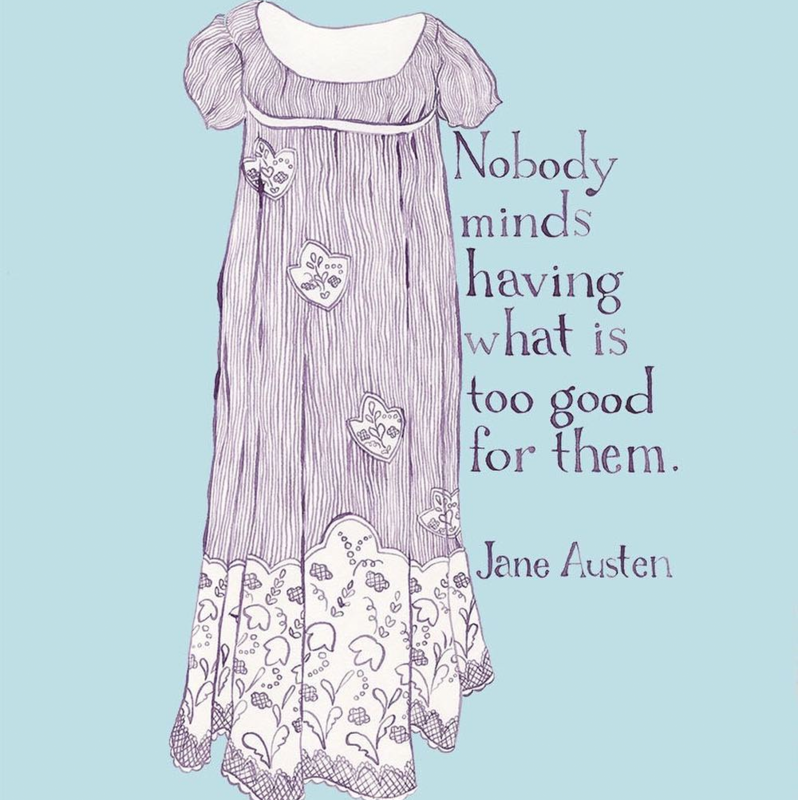 Afterwards, I headed back to the Lynwood House to get myself ready for the Regency Costumed Masked Ball. 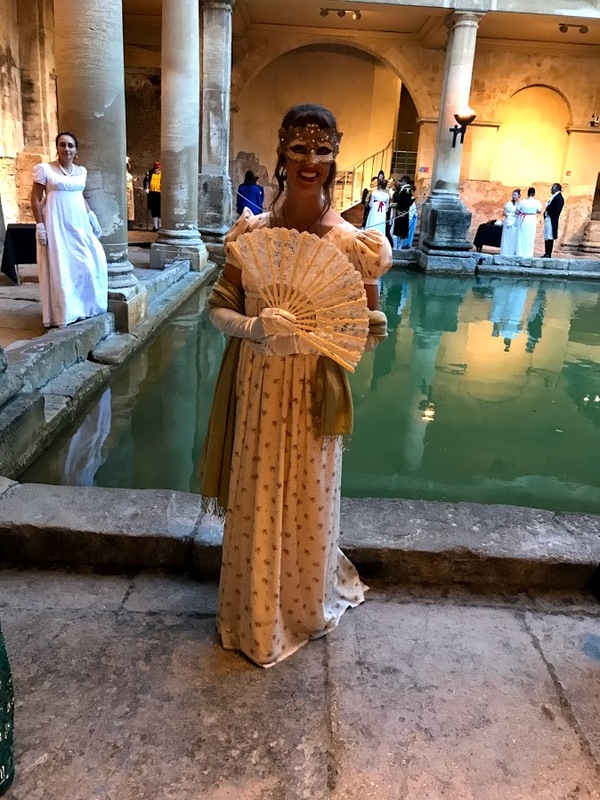 Donning my second Regency ballgown I sewed for myself, I made my way through the streets of Bath to the Roman Baths where the reception was held. I put my spencer jacket in the cloak room, headed downstairs, was served a glass of champagne, and then was formerly introduced as Ms. Smith from the Spanish colonies. 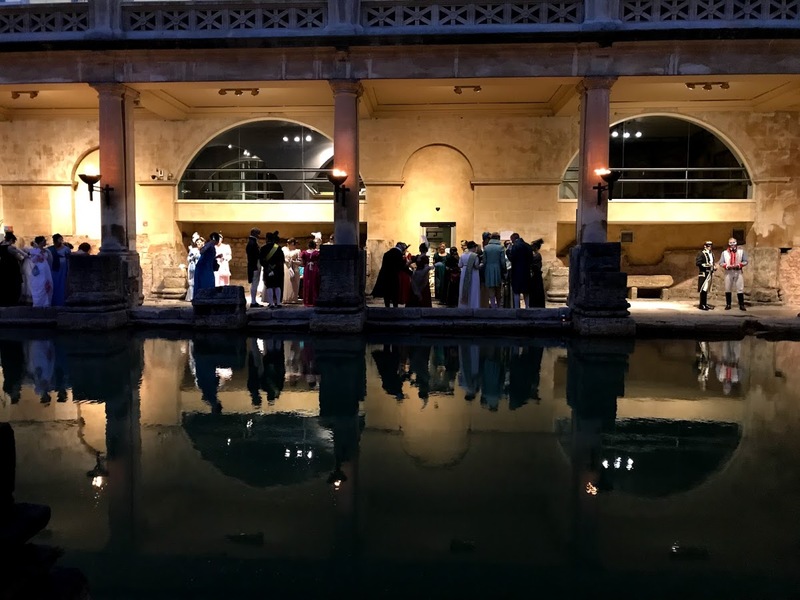 I stepped out into the Roman Baths, and it felt so magical seeing the baths lit up with torches, live music floating through the air, and the area filled with people in Regency costume. 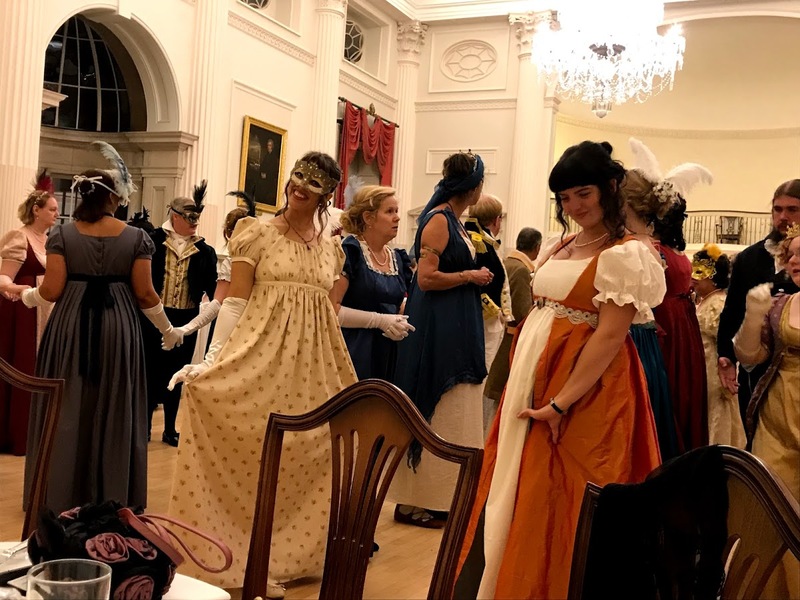 I did feel like it was a disaster waiting to happen, with everyone in empire waist gowns, uneven and slippery flagstones, champagne flowing freely, and a giant Roman Bath in the center. Luckily no one fell in! After the reception we were led up into the Pump Room for dancing and dinner. I danced every dance of the evening and felt just like Cinderella at the ball – a fairy tale come true.